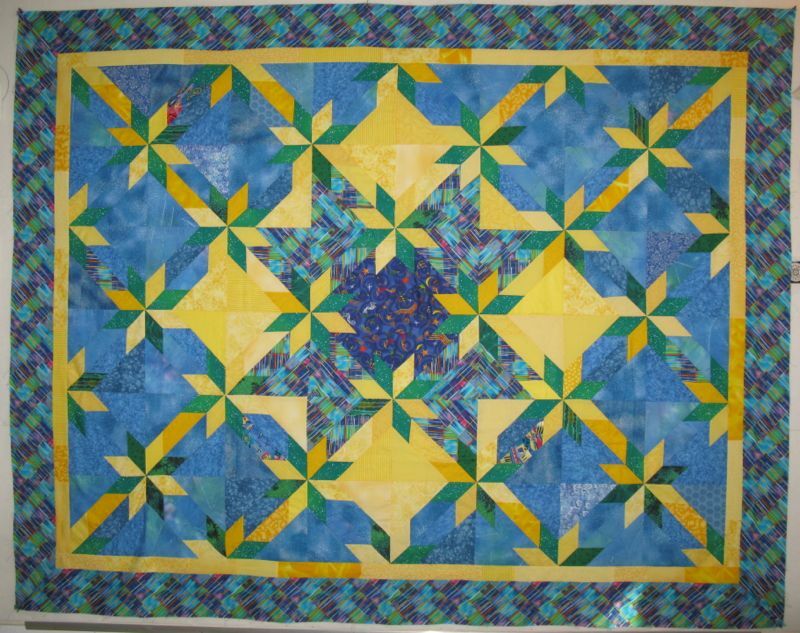 WIP–An Oldie, But Goodie | OccasionalPiece--Quilt! Posted on August 27, 2013 by Elizabeth E.
I made this for my youngest son’s college freshman dorm bed when he went off to school, lo these many years ago (now he’s married, has a job and is getting his masters). I got this far, and he kinda said he wasn’t really happy with it, and could he have something else? So I made him something else, and this has sat for years in the back of the closet. Today was the day to do something, after so many of you wrote so many encouraging things back to me. It was helped when I folded back the panel on the right to make it more symmetrical. It’s still such a 1990s quilt, though, isn’t it? but I do love the Hunter’s Star pattern. And wrapped up in the wad of fabrics that I’d stuffed in the cupboard, lo those many years ago, were the outer borders, already cut. I wasn’t going to second-guess my 1990s mind, but I did add the inner yellow border, made up of different yellows in the quilt (and yes, I still have some of those in the stash, too). 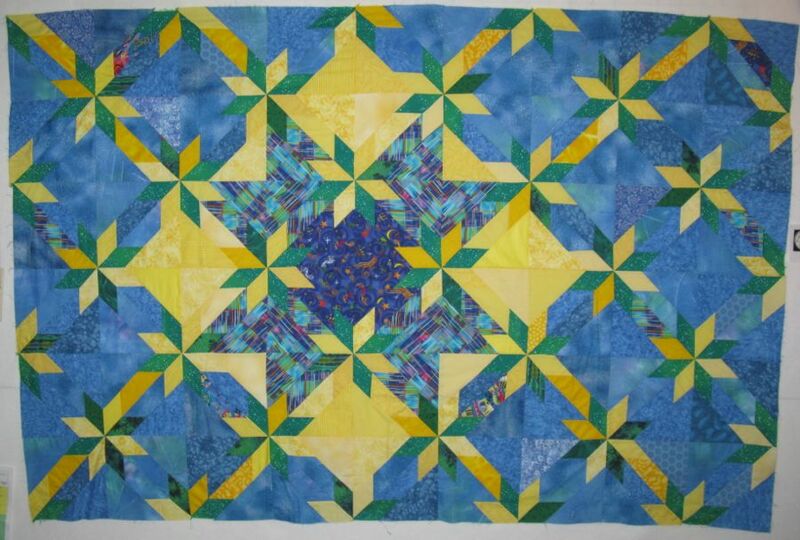 So, now it’s off to the quilter’s–my first quilt to go there in probably four months? It was good to see her again, and to hand it over. 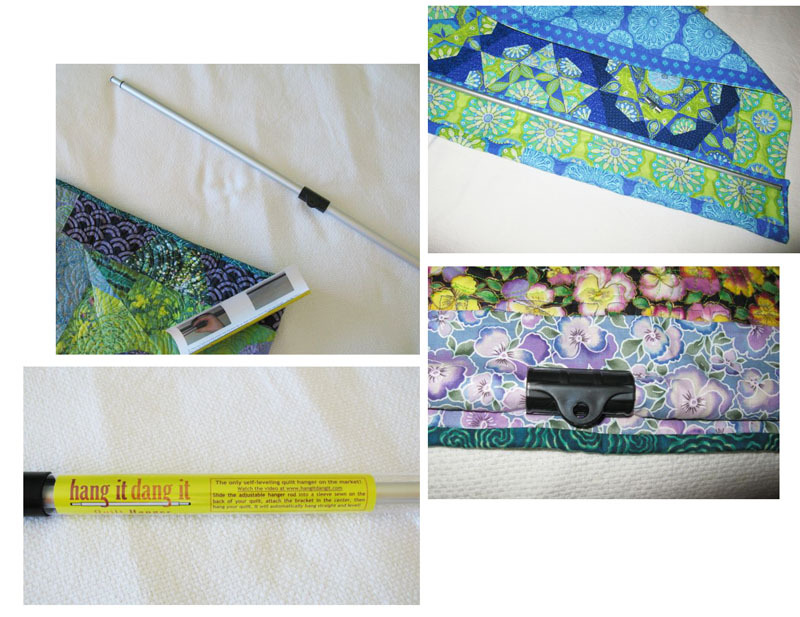 I also was delighted to receive my “hang it dang it” quilt rods. It’s basically an aluminum tube which you pull out to the width of your quilt (they have three different sizes), twist the rods to anchor them to that size, then snap the clasp on the center. They have a magnetic clasp and a plastic clasp. I bought one of each, but really, the plastic clasp works fine (and is cheaper). They even have a video to show you how. One nail and your quilt is hanging up, invisibly. No rods show, nothing. 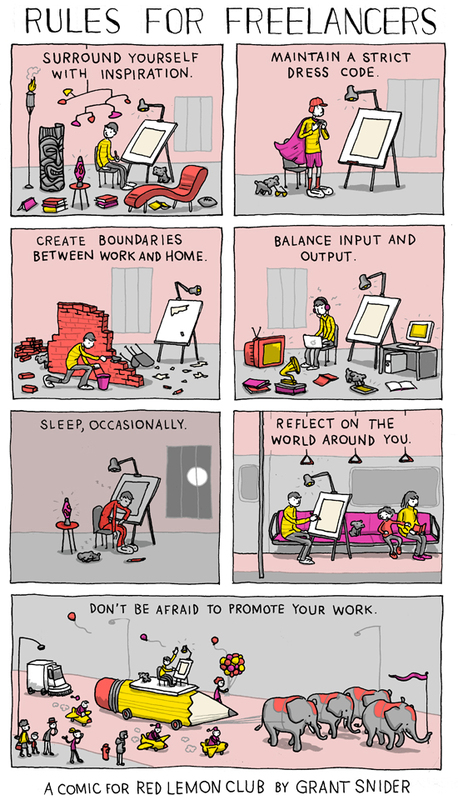 Dot, one of the commenters the other day, in response to my “doldrums” post, referenced me to a carton by Grant Snider, done for Red Lemon Club, a site that caters to the creative type. I spent some time there, reading articles, re-learning about what it means to be a creative person. I think we all find ourselves feeling that way from time to time. It’s called overwhelmed. Something has to go, and it’s usually our hobby time. I find if I don’t sew for a few days I get cranky. Creative ebbs and flows and sometimes over flows, you’ll get back into the zone soon. In the meantime, follow your bliss, not your list. It really is hard to find the time to do it all. So it was nice today to do a little. Cut a few strips. Resurrect an oldie-mouldie and move it to a different place, feel some cloth. Linking up to WIP Wednesday at Freshly Pieced, and WOW at Esther’s Blog. What I’m taking away from this post is “follow your bliss, not your list.” Love it! I am left wondering what quilt your son got for the dorm. I love that you have finally finished this one. I see the hanging rod still goes in a sleeve but how can it stay nice with just one nail? That’s it – take the re-entry at your own speed – the mojo will return. I’m doing small things right now and having a fit to get back to my real quilting, but then, the small things are turning out pretty cool so taking the time to enjoy the ride must be a good thing, right? Like you, I haven’t seen my quilter in months and miss her terribly (as does the dog). Dorm quilt looks pretty good, btw! I love the hang it dang it too! I forgot to mention how lovely I think it is that your father still goes to his studio to paint . Wonderful. So nice to hear about how the hang it dang it really works. I have heard about it but did no further research. I think these would work so well for my house. It is good you took out an old project and decided to finish it. You liked it many years ago, thus worth finishing it. I gleaned much from the other comments here, especially “follow your bliss, not your list.” I recently thought I would start a list, but I think it would compartmentalize me and not allow creativity. I have always loved the Hunter’s Star pattern – in ANY fabric. I’m glad to see that you are going to finish it up. The Hang It, Dang It looks like a great idea. I haven’t seen them before. GREAT cartoons. They really do say it all. 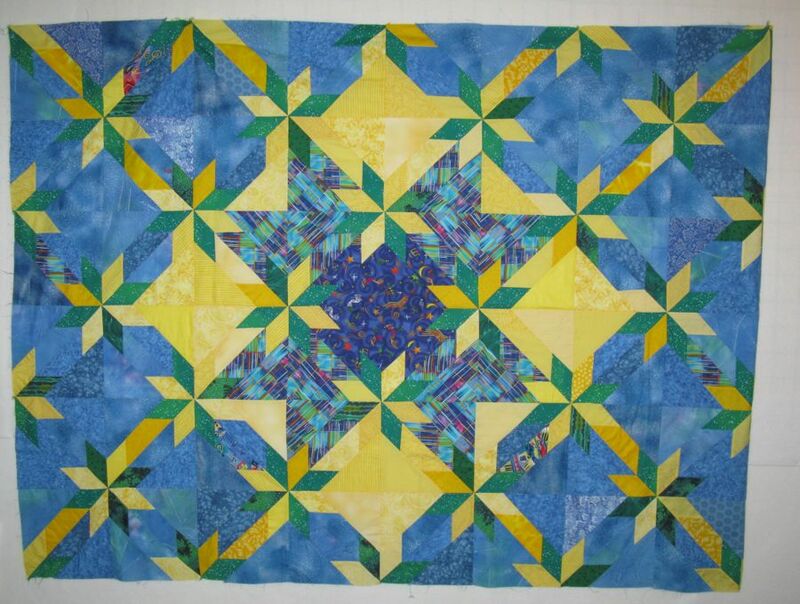 Beautiful job on the Hunter’s Star quilt, although I think I like the assymetrical better. Just me. Lovely either way. Somebody at our guild was raving about the Hang It, Dang It a couple months ago. Looks like a super clever design. And simple! I might have to spend some time checking out this website. Although, right now I’m not lacking for ideas, just time to do them!